The story begins back in 1996. Cosmin Damian and Mihai Dumitru were working on several firewall and routing related programs on linux when a local entrepreneur from Timisoara decided to venture onto a new type of business - the cybercafe. 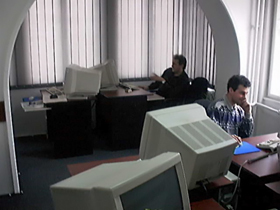 The image at the right shows one of the first Romanian cybercafés, located in Timisoara. The first version of the future 'Contor 2000' was rather a shell script performing routing and firewall tasks while storing the results in a flat database. As the requirements grew fast, this initial step was quickly dropped and a new development started. Since 1997 the package radically changed. The core consisted in a server written in ANSI C, capable of performing the various firewall tasks on a linux router and sending the results to an SQL server. Communication between the server and the user interface was moderated through a server-side client in order to increase security. The user interface shifted from the previous terminal window to an appealing web interface, by using the PHP scripting language. The whole thing changed, and all further development followed this path. The programs were already running on three locations in Timisoara, and the demand for new set-ups and features grew along with the emerging new businesses. The project continued to grow and spread, being in use in over 100 locations. Lots of supplemental features were added at customer request - different night/day fees, and a hardware component developed by the Mayon Computers team to remotely control powering up the workstations. The component was a small piece of hardware controlled through the Ethernet wires and it had the ability of cutting the workstation’s power when the core server instructed it so; it had a central hub connected to one of the server's serial ports ( RS232) . Nowadays the software runs only in two locations and the project is no longer supported. It seems the times of cybercafés are long gone.